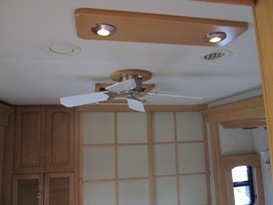 You are here: Home / Blog / Motorhome Ceiling Fan And Custom Light Panels! 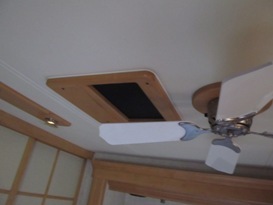 One of our more popular requests seems to be adding ceiling fans to the bedrooms of our customers RV’s. This customer wanted the ceiling fan added and also was looking for an upgrade to the fluorescent lighting down the center of the coach. Another thing on their wish list was an upgrade to the mirrored closet doors in the bedroom. 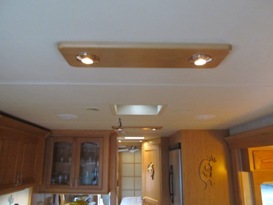 We came up with a design for the lighting with custom build maple panels and two spot lights in each. We also replaced the plastic air inlet shrouds with custom built wood replacements. The new ceiling fan is remote operated and available in several different colors. A solid wood base for the fan tied it in with the light panels. 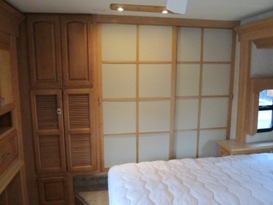 The closet doors were also custom built with a fabric insert and new track and locking system.